Bucks Fall On MLK Day ~ The Bucky Channel - The World of Sports from Wisconsin's Perspective. The game between the Bucks and the Houston Rockets was very ugly in the first half, which I believe is because they play during the afternoon on Martin Luther King Day. I'm not a huge fan of weekday afternoon Basketball either. I had to work all day yesterday, unlike some other people I know, so I was unable to watch any of the games on. Also since almost all NBA games are played at night, except for some Sunday games, it really changes the way these guy prepare for a game. Still both teams had to deal with it, and after seeing the first half stats, neither team did a good job of it. The Rockets took down the Bucks Monday 93-84, pushing the Bucks record to 14-24 on the season. On a day we as a country celebrate Martin Luther King I may have to steal a line from him, because before the season I had a dream that this team would be good. However, the goal I had dreamed about for this team is all but impossible right now. Right now this team needs to focus on just making the playoffs as the 7th or 8th seed. Back to the game at hand, as wow, this was just an awful effort by the Bucks. At halftime the game was tied 39-39, with the Bucks shooting 17-43 from the field (40%), 5-9 from the free throw line (56%), and 0-4 from three point (ouch). I was watching the box score online at work, and all I could think was Thank God I'm not watching this on TV right now. It was missed shot, after missed shot, after missed shot. It wasn't a good day to be a Bucks shooter. The good news was in the third quarter both teams woke up on the offensive end, but the bad news was that the Rockets woke up more than the Bucks. The Rockets went off to score 35 points in the third quarter, which was just four less points than they scored in the first half. 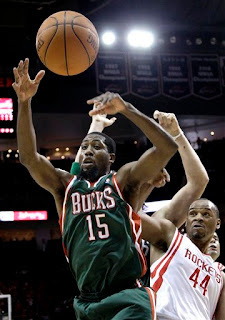 The Bucks were able to put up 27 points, but just couldn't close the gap in the fourth quarter. The Bucks cut the lead to five with 5:41 left in the game, but that was as close as it would get. Drew Gooden put up a double double for the Bucks off the bench. He finished with 14 points, 11 rebounds, and 2 blocks. Good to see him play well again, but we need him to be more consistent. Dooling and Ilyasova had a rough day as they finished a combined 7-24 from the field, with 16 points, 10 rebounds, and 5 assists. The worst part about all of that is they put up all those stats in 59 minutes of play. Never going to be easy to win games when two starters put up numbers like that. I said this was going to be a huge week for the Bucks, because they had a real good shot of going 3-1, or maybe even 4-0. They will not be going 4-0 this week, so lets just start taking this game by game. Wednesday night they will face the Wizards, who seem to be a running team now after the trade with the Magic. Monday the Wizards were able to take down the Jazz at home 108-101. This will be no walk in the park for the Bucks, but they need to start getting wins sooner than later if they want to make something of this season.